1990 Topps Traded Baseball marks the first time the set was available both as a box set and through wax packs. However, its lackluster checklist prevents the set from standing out in almost every conceivable way. Keeping the same colorful design from 1990 Topps Baseball, the late-season update has 132-cards. They are noted with a 'T' suffix on the numbering. Variation collectors can chase after two different versions of every card. Those inserted in the factory set use white card stock, leaving backs bright. Cards from wax packs have a grey card stock on the back. Neither version carries a premium. 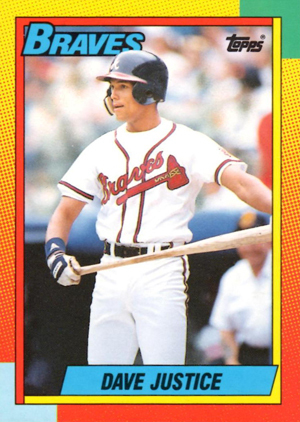 Key rookies in 1990 Topps Traded Baseball include John Olerud, David Justice, Carlos Baerga and Travis Fryman. Dave Winfield and Gary Carter are among the veterans to appear with new teams. 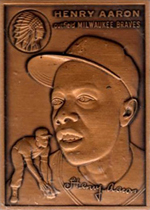 A small miniature bronze card of Hank Aaron was given to dealers as an incentive for buying cases of 1990 Topps Traded Baseball factory sets. The card measures 1 1/4" by 1 3/4" and gives a metal makeover to the Hall of Famer's 1954 Topps rookie card. 1990 Topps Traded Tiffany John Olerud RC. Mint. #83T. Given as incentive for ordering factory set cases. Card measure 1 1/4" by 1 3/4". 1990 Topps Traded was an abomination much like the regular 1990 Topps issue. It was simply a super ugly design that looked like a crayon threw up. With Upper Deck producing great looking cards Topps didn’t even attempt to try to compete with them until the 1991 set. The 1990 Topps release will go down in history as one of the ugliest Topps card designs ever. Many folks (myself included) enjoyed the colorful and period-correct design of 1990 Topps. You can’t have white borders every year, so sometimes being different is a good thing. 1990 LOT 2 TOPPS TRADED MLB WAX BOX UNOPENED 72 PACKS SUPERSTAR ROOKIES !